This self-paced distance learning course provides forecasters, students, researchers, and other interested learners with a foundation in the products and applications from multispectral satellite observations and various methodologies used to derive multispectral image products. Help learners, especially those involved in day to day operations, improve application and interpretation of multispectral products in everyday meteorological and environmental monitoring and forecasting activities. This course assumes a basic understanding of the interaction between radiation and matter that enables satellites to detect various elements and their properties in the earth-atmosphere system. This background information is essential for understanding the spectral signatures that occur throughout the spectrum, how spectral signatures influence channel selection for designing satellite instruments, and how channel selection relates to the development of multispectral products. 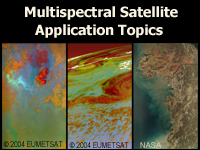 The multispectral satellite application topics distance learning course is a series of modules aimed at forecasters, students, researchers and others who have either a need or desire to know more about multispectral image products and their application. The course is intended to help learners develop or improve their understanding of multispectral imagery and products and will show examples of how some products are derived and their applications. The course will help prepare the learner for future exploration and use of multispectral products in meteorological analysis and forecasting, and in other disciplines that involve environmental monitoring and prediction. To receive a course completion certificate, you must successfully complete a minimum the four core modules plus which collectively may take about 6 to 8 hours to complete. Presents a variety of near real time single image and multispectral image products from Geo and Leo satellite platforms to demonstrate the potential sensing capabilities of the Visible/Infrared Imager Radiometer Suite (VIIRS) imager. VIIRS was launched on board the Suomi NPP spacecraft in October 2011 and is planned for future JPSS satellites beginning in 2016. Provides daily MODIS single channel and multispectral image products in near real time presented by geographic regions or orbit overpass time. The site also includes a gallery of notable weather and other environmental events. Provides access to multispectral imagery for global events and discoveries related to climate and the environment. Provides access to near real time multispectral RGB products from the Meteosat geostationary satellites for a variety of meteorological applications. The site includes product descriptions and online tutorials (referred to as “Interpretation Guides”). Provides access to a selection of near real time multispectral satellite products produced to emulate capabilities of the next generation GOES-R satellites. A collection of examples of meteorological satellite imagery and products that are available to (or created by) scientists and researchers at NOAA’s Cooperative Institute for Meteorological Satellite Studies (CIMSS), located at the University of Wisconsin – Madison’s Space Science and Engineering Center (SSEC). Interesting and/or educational satellite images including multispectral images and applications relevant to current weather events are shown and discussed.